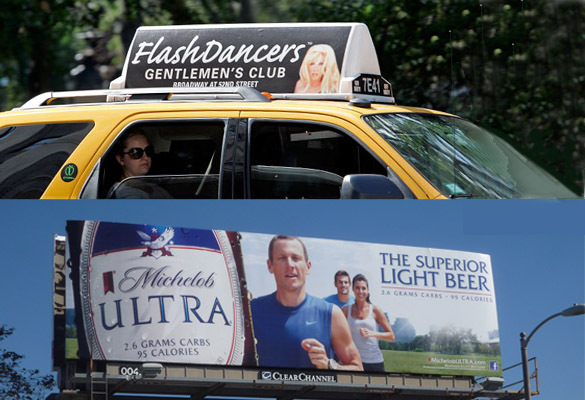 Top, Show Media taxicab ad in New York; bottom, Clear Channel billboard in L.A.
A Las Vegas-based entrepreneur who made millions selling ad space on taxicab roofs wants a piece of the L.A. billboard market, now dominated by Clear Channel and two other billion-dollar corporations. But how does his company, Show Media California, hope to do this when new billboards in the city have been banned since 2002? The answer is that Show Media hopes to get landowners with billboards on their properties to tell Clear Channel, CBS Outdoor and others to take a hike when their leases expire, and sign new–and presumably, more lucrative–leases with the Las Vegas company that operates taxi top advertising in New York, L.A., and Miami. The only hitch is that since the billboard ban was adopted, the city has only allowed maintenance and repairs to existing billboards–complete replacement is prohibited. 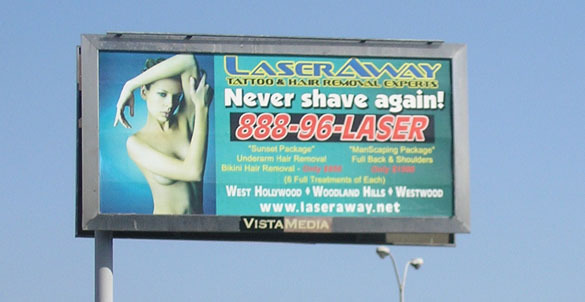 This Lamar Advertising billboard at the edge of a shopping center parking lot was permanently removed when a Whole Foods Store located at the site. The intent of that prohibition was to gradually reduce the overall number of billboards in the city, because a sign that deteriorated to the point where it could no longer be repaired would have to be permanently removed. But not to be deterred, Show Media has followed in the footsteps of so many sign companies and sued the city, arguing that this prohibition is unconstitutional because it allows existing billboard owners to maintain their signs indefinitely, in effect taking away the rights of those landowners with billboards from freely negotiating with other sign companies that couldn’t legally put up new billboards, even if they were identical in size and location to the existing signs. Last fall, a U.S. District Court judge dismissed Show Media’s challenge, but the company appealed to the 9th Circuit Court of Appeals, where arguments are pending. Show Media California is one of several companies owned by Laurence Hallier, who according to media reports started his first taxi top advertising venture in 1994 in Las Vegas, and later expanded to other cities. Hallier is also a real estate developer, with major projects in Nevada, Texas, and California. Hallier is reported to be the ex-boyfriend of actress and celebrity gossip target Pamela Anderson, who is currently suing him in federal court for breach of contract, alleging that she was promised a condo or payment of $1 million for promoting a residential development in Las Vegas. In another court case, Show Media was sued two years ago by Clear Channel, which operates a competing taxi top advertising service in New York. That lawsuit, which alleged that Show Media had illegally used Clear Channel’s copyrighted media kit, was settled out of court.